It is sad to see that most of us, Muslims, only consider a’qaid and ‘ibadaat to be the components of deen and are completely ignorant of the rest. Few select practicing ones include ma’amlaat to be deen also. Ikhlaq, all praise to Allah SWT is practiced by those involved in tasawwuf. The Shariah ruling regarding how to live a civilized life is abandoned by most of us. However, it is ironic that we brothers/sister who are involved in discussions of higher & lofty realities of Tasawwuf are disregarding the rights of fellow individuals. The fact remains true that the rights of fellow human beings (haqqul ‘abd) can not be forgiven by repentance alone. It require asking forgiveness from the aggrieved individual. Most of us are totally unaware of the rulings of Shariah pertaining to the etiquettes of civilized living. The extent of this ignorance is so great that enemies of Muslims regard Islam to be incompatible with the civilized world life. Post 9/11 western strategy is to modify Islam to make it civilized.Hakeem ul Ummat Mawlana Ashraf Ali Thanawi ra being the mujaddid high lighted the importance of these rulings in most of his discourses and writings. 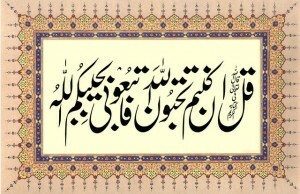 The most beneficial of these is a concise treatise “Aadab ul Ma’ashrat” (Etiquettes of Civilized living). The importance of this book is evident by the fact that it is the first reading in the nisab e Tasawwuf (curriculum for salikeen) recommended by Hakeemul Ummat ra. InshaAllah, quotes from this book regarding some important and common lapses in our every day (uncivilized) life will be posted here. Allah SWT give us the tawfeeq. Ameen! This entry was posted in A. Reality of Tasawwuf, B. Praise worthy morals, C. Blame worthy Morals, D. Acts of Worship, E. States, F. Zikir & fikr, J. Rights , N. Advice, Q. Akabir, S. Sunna, T. Tarbiyet, W. Wird & wazaif, Z. Mustahebbat on December 28, 2005 by 'abd.